The iPod nano, a portable player to fit a clock pocket on your jeans, starts the latest line-up of Apple’s iPods. From the iPod mini this player takes a small ClickWheel while in all the other features it is similar to the iPod color display. Put in a steel case with a 1.5 inch 16-bit color backlit LCD display the iPod nano 1st Gen player supports the photos playback but lacks a video out. The player doesn’t support the iPod Camera Connector either or any third-party solution. Thus, the small iPod screen is the only view option for a user. The iPod nano 1st gen is available in two colors – “ibook white” and jet black – and in three capacity models. Brand new software features includes a screen lock, a stopwatch, and a world clock. The battery provides up to 14 hours of music playback and up to 4 hours of photo slideshows synchronized to music. Introduced on September 7, 2005. Processor Speed: 80 MHz (x2). Storage capacity: 1 GB, 2 GB, 4 GB. Display: 1.5-inch (diagonal) LED backlit color LCD, 176 x 132 (.168-mm dot pitch). Dimensions: 3.5 x 1.6 x 0.27. Battery Type: Lithium ion battery provides 14 hours of playback. Colors: iBook white, jet black. Store songs and digital photos for listening and viewing on the go. You can listen to podcasts, downloadable radio-style shows delivered over the Internet. View photos as a slideshow with music on iPod nano. Listen to audiobooks purchased from the iTunes Music Store or audible.com. Store or back up files and other data, using iPod nano as an external disk. Synchronize contact, calendar, and to-do list information from your computer. Play games, store text notes, set an alarm, and more. Hold switch – Menu button – Previous/Rewind button – Click Wheel – Center button – Next/Fast-forward button – Play/Pause button – Serial Number (on back) – Dock connector port – Headphones part. Using iPod nano controls: The controls on your iPod nano are very easy to find and use. Press any button to turn on your iPod nano. The main menu appears. Use the Click Wheel and Center button to navigate through onscreen menus, play songs, change settings, view information. Move your thumb lightly around the Click Wheel to select a menu item. To choose the item, press the Center button. To go back to the previous menu, press Menu on the Click Wheel. When you scroll through menu items, you can hear a clicking sound through the device’s internal speaker to let you know the Click Wheel is working. You can set the Click Wheel sound to play through the headphones instead, or you can turn it off. Set Clicker to Headphones: Set the Click Wheel sound to play through the headphones. Set Clicker to Off: Turn off the Click Wheel sound. Set Clicker to Speaker: Set the Click Wheel sound to play through the iPod internal speaker. 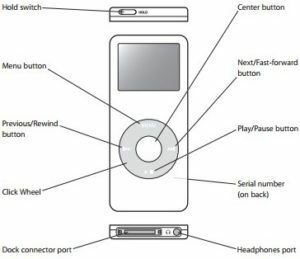 Set Clicker to Both: Set the Click Wheel sound to play through both the iPod nano internal speaker and the headphones. If you’re carrying iPod in your pocket and you don’t want to turn it on or activate the controls accidentally, you can make them inactive using the Hold switch. Slide the switch toward the center (so you can see the orange bar) to disable the controls. Lock icon – The Lock icon appears when the Hold switch (on top of iPod nano) is set to hold. When the switch is set to hold, the iPod controls are disabled. Menu title – Displays the title of the current menu. Play status – The Play icon appears if a song is playing. The Pause icon appears if a song is paused. Battery status – The Battery icon shows the approximate remaining battery charge. If the battery is charging, the icon is animated. Menu items – Use the Click Wheel to scroll through menu items. Press the Center button to choose an item. An arrow next to a menu item indicates that choosing it leads to another menu. You might want to add often-used items to the iPod nano main menu. For example, you can add a “Songs” item to the main menu, so you don’t have to choose Music before you choose Songs. To add or remove items from the main menu: Choose Settings > Main Menu. Apple Model No: A1137 (EMC 2066). Original price: $149 (for 1GB, $199 (for 2GB), $249 (for 4 GB). A product from the pre-touch era, the first Nano is nevertheless highly appreciated by users. It sounds nice and has a scratch proof case. Its plastic display though is easy to scratch, but it never influences the functionality. Sell your used iPod nano and any other iDevice you don’t need anymore to iGotOffer for the best price online! : Sell iPod nano online now. The history of the iPod nano. Video published by 512 Pixels on January 17, 2016. Since its introduction in 2005, there have been several generations of iPod nano. Apple’s small music player has been at the heart of the company’s music strategy for over a decade, and has seen a lot of changes in its lifetime.